Anyway, so here’s why we’re interrupting your day: we’re looking to spotlight homegrown Nigerian academics for a series we’ve conceptualized – Naija Doctorate & Proud. First of all, we acknowledge that getting a PhD is not a walk in the park; listen, any form of academic pursuit after primary school is stress. However, determining to get to the top of the academic scale is being a BOSS! It is for this reason that we’d like to celebrate, spotlight, showcase PhD holders who got their doctorate degrees from Nigerian Universities. We love you and want to let the world know that you guys are the real rock stars. So, send us an email, let’s share your story. 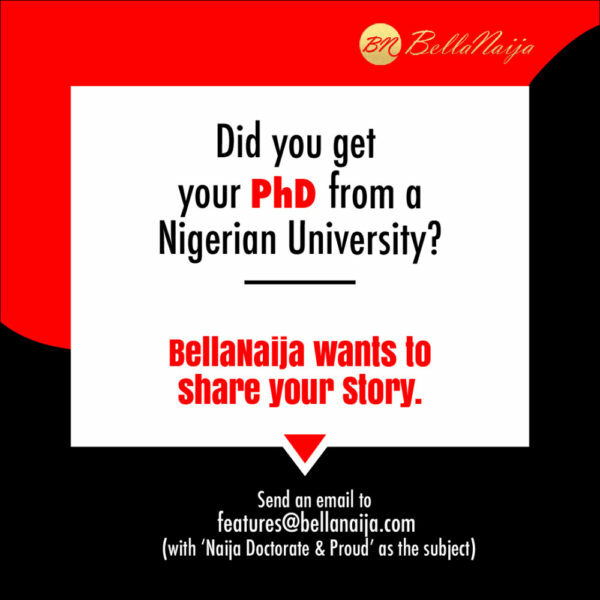 Email: features(at)bellanaija(dot)com – with the “Naija Doctorate & Proud” in the subject line. Tell us the name of the institution, your major (area of specialization) and why you decided to get a PhD! This is nice, living the idea. Looking forward to reading some features. Thanks BN for this. Ohhhh bellalove it when there’s something new and different from the usual. Look forward to more stuffs guyz yikes.